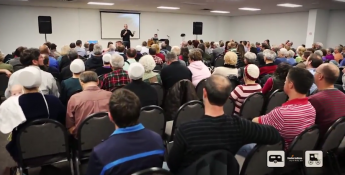 reviveINDIANA is leading revival by uniting churches in Northern Indiana. GOSHEN, Ind. - Jan. 5, 2015 - PRLog -- On January 12th, locals, out of towners, intercessors, and many different congregations desiring revival in their hearts and communities will gather together for a week to pray for and pursue revival. This week-long prayer event, held daily from the 12th - 18th, 7 a.m. - 8:30 p.m., will host times of prayer, worship, fellowship, and food. All are welcome. Revival is coming to Northern Indiana. Time to Revive (TTR) and Founder, Dr. Kyle Lance Martin, pray that hearts will be softened for the Gospel of Jesus. Many ask, “Why do we need revival?” Sr. Pastor Phil Byars, from First Baptist Church of Elkhart, one of the first to jump on board with reviveINDIANA, couldn’t help but get his church involved; here’s what he’s seen as a result of reviveINDIANA in just a few short months. Corporately, I have never seen our people more excited, overall, about getting involved in a movement of the Spirit like this. People are coming out of the woodwork with remarks like this: ‘I’m in! Sign me up! This is so exciting! God is really going to do something great!’ We are already seeing early harvest, as we have seen 23 people come to faith in Christ in the last 14 days through our ministry. God is moving and we are following. Thank you, Time to Revive, for bringing the challenge to Indiana! I’m excited to be able to partner with TIME TO REVIVE in the REVIVE INDIANA PRAYER WEEK January 12-18th. Nothing happens until God’s people pray and there’s no better way to start the year than with corporate prayer. As E.M. Bounds said, ‘Little prayer little power, much prayer much power!’ - Senior Pastor Dave Engbrecht of Nappanee Missionary Church, Nappanee, IN. Small groups of Christ-followers have prayed for revival in our area for years. How could I say ‘no’ to something I've prayed about for so long? God can do more in seconds than we could do in a lifetime. - Pastor Fred Stayton of Bristol United Methodist Church, Bristol, IN. reviveINDIANA, along the Heritage Trail, covers a region full of history and rich tradition. It’s also TTR’s 11th state in the USA. The invitation for TTR to equip the saints in Northern Indiana came in July 2013 from an Amish man from Millersburg, IN. After many conversations and much prayer, the Lord confirmed TTR’s calling to pour into Indiana in September 2013. The Northeastern portion of the state is an area known for its recreational vehicles (RV’s) and manufactured homes, as well as the Amish and Mennonite community. We are asking the Lord to direct our steps alongside local believers. We are praying for open doors to meet with folks who are of the same mind – people who want to see the Spirit of God change lives in this community of Elkhart County – believers who desire to see revival fall afresh on those in LaGrange County. In being revived as one body in Christ, may we see spiritual transformation take place in this community through of the Gospel of Jesus, one heart at a time. Uniquely enough, Middlebury, IN is the hometown of Dr. Kyle Lance Martin, the founder of TTR. Seventeen years ago, Kyle was working at the local family Ace Hardware and delivering newspapers. Just like the woman at the well who ran back to her hometown to share who Jesus was in her life (John 4:28-29), TTR is running full-steam back to their roots, their hometown, to declare Jesus and encourage His Church. Dallas-based TTR began with the 2007 Dallas Revival and has since ignited eleven other city awakenings: Revive Santa Fe (NM), Awaken the Valley (Sedona, AZ), reviveFLINT (MI), reviveASHEVILLE (NC), reviveSEATTLE (WA), reviveDEVILS LAKE (ND), reviveRICHMOND (CA), reviveCOLUMBIA (SC), reviveTWIN CITIES (MN), reviveINDIANA (IN) and reviveTUPELO (MS). reviveINDIANA is a gathering of churches and believers along the Heritage Trail in Northern Indiana who desire to see their lives, congregations, and communities revived by embracing Jesus Christ and making disciples. The Heritage Trail includes towns such as: Bristol, Elkhart, Emma, Goshen, LaGrange, Middlebury, Millersburg, Nappanee, New Paris, Shipshewana, Topeka, Wakarusa, and Wolcottville. reviveINDIANA.org, facebook.com/reviveINDIANA, or twitter.com/reviveINDIANA. Time to Revive seeks to encourage believers to embrace their relationship with Jesus Christ and to share the Truth that transforms lives in preparation for the return of Christ. Our organization pursues outreaches in Dallas and across the nation that give believers an opportunity to join together and share Christ in serving communities with spiritual needs. timetorevive.com, facebook.com/timetorevive or twitter.com/TimeToRevive (http://www.twitter.com/TimeToRevive). Time to Revive Participates in North Texas Giving Day for the 2nd Year!